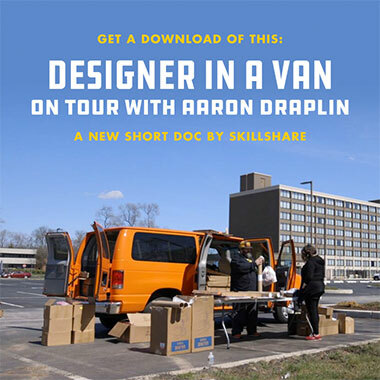 Draplin Design Co.: NEW SHORT DOC: "Designer in a Van: On Tour with Aaron Draplin"
FOR IMMEDIATE RELEASE: The tour is done and the van is unpacked�€�and we miss the big road! And all the faces and handshakes and good times. Thank you to everyone who came out to a show the last couple months! AND DON’T FORGET OUR THREE SKILLSHARE CLASSES: These things are still raging along! Get in there and get weird with them! Totes stoked to watch this, but the link is not working. the link to the vid is just a teaser not the 10 minute thing. Just FYI.